The floodgates have opened for cheap IPS technology and the screens keep on flowing. 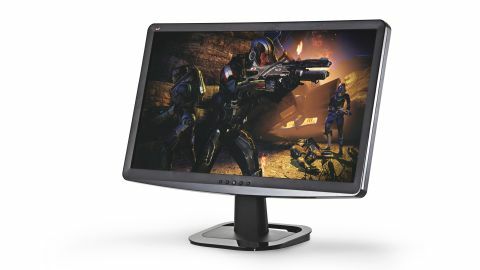 Our latest low-priced IPS candidate is the new ViewSonic VX2336s-LED 23-inch Full HD PC monitor. The ViewSonic VP2365-LED, too, is one of the brave new low-cost IPS army members, with a UK price of £200 and US price of $349. Costing just £160 in the UK or $198 in the US, however, the ViewSonic VX2336s-LED is even more affordable. Inevitably though, something has to give. Most obvious is the loss of a fully adjustable stand. The ViewSonic VX2336s-LED gets a very rudimentary tilt-only affair. The chassis itself isn't exactly luxurious, either. Arguably what really matters is how the quality of that Xtreme View IPS LCD panel stacks up. Is it as gorgeous as the more expensive ViewSonic VP2365-LED? Likewise, how does it compare to the conceptually similar AOC i2352Vh, which packs a cheap IPS panel into a similarly no-frills enclosure? It's all about the image quality. That's our number one priority when it comes to PC monitors, so we're willing to forgive all manner of peripheral faux pas if the screen's a corker. That's especially true in the context of the ViewSonic VX2336s-LED tight £160/$198 pricing. Granted, the AOC i2352vh is even cheaper, but by historical standards, this is still a startlingly cheap IPS monitor. So let's start with the good news. The image quality is simply fantastic. The ViewSonic VX2336s-LED is every bit as lovely as its VP2365-LED sibling. It's got the same fabulous colours, and the same great viewing angles. Even better, just like the VP2365-LED, it doesn't suffer from some of the traditional downsides we normally associate with IPS panels. For starters, the anti-glare coating is nice and smooth, not grainy and sparkly. What's more, there's little evidence of that annoying IPS glow. We're also pleased to note there's none of the edge bleed that blights the otherwise excellent AOC i2352vh. Overall, then, you're getting pretty much identical image quality to the pricier ViewSonic, just for £40 less. Of course, what you're probably not getting is genuine 8-bit or 10-bit channel colour. Many of the latest cheap IPS panels are 6-bit colour per channel. We think that probably applies here. Frankly, unless you're a graphics professional, that's of little consequence. This is a gorgeous panel. That said, you will have to live without a fully adjustable chassis. At least there's a 75mm Vesa mount, enabling you to use an aftermarket stand. You'll also have to make do with just DVI and VGA connectivity. For a PC monitor, we think that's just dandy. But it does mean this monitor isn't ideal for tag teaming with a games console or various other HD set-top boxes. Image quality, image quality, image quality. That's what this screen is all about. Thanks to its IPS technology, it really delivers. Just a year ago, screens at this price point were only available with mediocre TN panels. So it's a real pleasure to find such a nice panel at such an affordable price. In an ideal world, we'd prefer 1920 x 1200 pixels and a 16:10 aspect ratio over the ViewSonic VX2336s-LED's 1920 x 1080 pixel grid and 16:9 aspect ratio. We're not fans of the tilt-only stand and the frankly pretty flimsy chassis, either. Despite some minor flaws, the ViewSonic VX2336s-LED is easily the best sub-£200 screen we've seen. IPS image quality has hit the mainstream. Hurrah.